Winter can be extreme in western Washington state, despite what you hear about our "gentle winters." As I prepared to take the Raven's Roots Tracking Immersion Course students out to the Olympic Peninsula, my friend and fellow tracker Kristian brought to my attention the extreme weather anticipated: 40+ mile an hour winds at the sandy coastal location I wanted to take the class, plus torrential rains. Maybe you say to yourself, well tough it out! But, think about it for a moment. If you are trying to track wildlife, and your tracks are blown away and at least half of your attention is on making sure you and your students don't get hit by fallen trees, perhaps it's really not worth it. I refused to cancel class, but we did move to a back up location in a totally different environment: the shrub-steppe of central Washington's Columbia Plateau. Our drive over was foggy and frost clung as thick as snow in some places on bowing plants, just above actual patches of snow on the ground. Conditions were colder than on the "wet side" of the state, but ideal for tracking. Between the open, sparse vegetation at our first field location, lay ribbons of snow. They were perfectly clinging to the wildlife trails that veined across the landscape of shrub tufted rolling hills and broken basalt cliffs. They made these trails pop to the eye, and thankfully for us, the animals obliged us and chose to use these snowy passageways, leaving us beautiful tracks. Our first sighting was of an odd shape in a small stand of willows that at a distance looked like a misshapen owl. As we neared, it was clear it was a porcupine, which was contentedly feeding on the cambium of the upper branches of a spindly willow. It didn't even stop when we pulled up in our van, but did suddenly take notice when we opened our doors. It decided to take evasive maneuvers and climb carefully backwards out of the tree, using its tail between each step not unlike a 5 limb to help slow its decent. Shortly after the porcupines decent we decided to move on and arrived at our first tracking location: the semi-frozen muddy edge of a lake. At times the mud creaked and crunched under foot, and in some spots in squelched softly. It was a fine, thick, clinging mud that allowed for even tiny tracks to register. We were not the only ones uncertain of the mud. In one spot, a deer mouse walked carefully off the edge of a partially submerged rock and stepped one tiny foot into the mud. Then, it quickly decided to change direction. Its tiny, deep foot print is dwarfed in the picture by the beautifully clear tracks of a killdeer. Nearby, crossing the trail of that same mouse were two strange parallel lines of grouped marks. You can see the mouse's tracks crossing the trail along the bottom of the image from right to left. After careful investigation we could see that the marks were grouped into 4 clustered dots. We discussed what kind of creature would leave such a trail, especially one leaving a shelter spot under a rock full of water? A crayfish! Higher up, in the more thoroughly frozen mud was a strange, abstracted sight. They were 7 inch long tracks of a great blue heron that had become filled in with drifting snow. Spattered between these were small bits of snow. Viewed sideways, the tracks looked so much like a flock of origami birds amongst wispy clouds. Our wandering took us along the shore to the dam on the lake, who's flood doors were open for reasons unknown to us. I got a little ahead of the group, pondering what route to take but student, Annika, called me back and pointed down below us into a narrow canyon-like channel. In the low water below the damn was a wide sheet of ice, and through the middle of it was a splendid sight: the dots and dashes left by a sliding otter! We walked onto the dam and looked down at this find with smiles. Looking in the opposite direction along the water way, we could see broken sheets of ice covering the channel, graced for at least a quarter mile by the energetic, joyous trail of the same sliding otter. It is difficult to explain in words the elation a tracker can experience seeing the pure abandon an animal can express through its tracks. Otters in particular express such beautiful, child-like joy in their movement. It is difficult not to be moved. After lingering for a moment, we moved on to pick up pieces of other stories. This time we came upon the braided trails of 2 coyotes. As we back tracked them through the patchy snow, we came to a place between some shrubs where both coyotes had stopped and sat down. The haunches of their hind legs visible behind their hind tracks, and their front tracks positioned just ahead. They both seemed to face the same way. Our tracking group stood around pondering what they were doing. Then it hit me, literally, albeit gently. There was a steady breeze blowing from the narrow, rocky canyon we had just come from near the dam. The coyotes must have sat there and inhaled the breeze blowing gently to them and bringing them news of what was around the bend and out of sight. Again, the intimacy of these tracks struck me deeply. 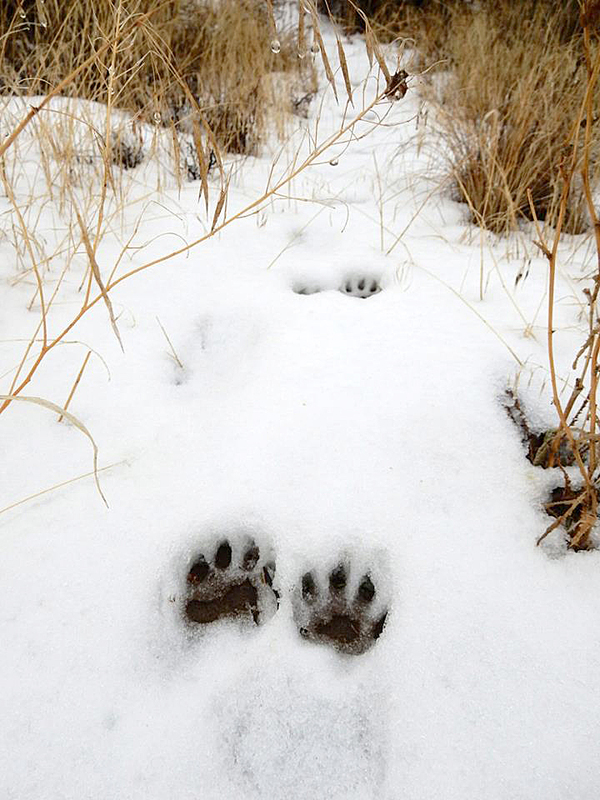 These two animals were utterly relaxed and in their element when they had made these tracks. For the briefest moment as trackers, we had a connection with the minds and hearts of these two coyotes. We stood where they stood, and smelled the same breeze. And remembered our animal selves. The following day, we packed up our camping gear and walked a short distance from camp through the snow. The previous night had brought to us hooting great horned owls, chorusing coyotes and rain. I thought the rain might sour the tracking conditions to the point where it would not be worth spending much time around camp. But, we walked out to look and did not come back for nearly 4 hours. As is so often the case, when you start tracking, start looking at the landscape closely and listening you get sucked in. Swept away and into some kind of adventure. First, the tracks of the ubiquitous eastern fox squirrels crossed and re-crossed most of the patches of snow in the campground. In our site alone, we observed at least 6 individual squirrels climbing together through the Lombardy poplars and sycamores. We could see from their tracks that they were traveling from tree to tree, as well as pausing now and again to scan and sniff the breeze. As we walked, we crossed a set of tracks of similar size, but different pattern. Rather than group in sets of 4, these showed the hinds landing partially or mostly on top of the fronts. That shape of the toes and pattern they made was different as well. They were the tracks of a mink. It was interesting to see where the mink had foraged, away from the water's edge and meandering through the campground itself, across largely barren ground and between sparsely planted trees. We pondered what it might be seeking, and thought that it was likely after the squirrels as there was not much else in the way of prey in that particular spot. We followed it as it bounded and loped in circles, until its trail was lost in on the road in a patch of ice and gravel. Not much further on, we saw the beautiful trail of a beaver through the snow, coming up out of a creek and circling around. As we looked around, there were many areas that showed both new and old sign of this animals presence. Including wire fencing around some of the campground trees to protect it from the beaver's felling. Here two of our students are investigating the details of the beavers trail. The second image is of a left front track of that same beaver. Further along the creek, we found more evidence of the beaver's activities, including a spot where it walked away from the creek into the dry uplands and harvested a group of big sagebrush branches. This is an unusual food for a beaver and we wondered why would it harvest this strongly aromatic, bitter plant? Building material? Insect repellent for inside the den? Eaten as a source of particular nutrients? We left with questions churning in our minds. Nearby, dramatic tracks showed the powerful impact of a fleeing mule deer's movements. The tracks were punched clear through the snow to the dirt underneath and sand sprayed out and ahead of the tracks. I paced out the distance from one set of 4 tracks to the next set. It was 16 feet! At first I assumed it was a pronk: a powerful, spring-loaded hop used by mule deer to cover distances over rough terrain. But the way the front and hind tracks were arranged, it looked more like a lope or a gallop. One thing was sure, this animal was moving incredibly fast! There were no associated tracks we could locate that clearly showed it was running from a particular threat or being chased. We pondered this mystery, as occasional distant shotguns sounded off from duck hunters along the far shore of the nearby reservoir. Spending time out in such an open landscape, you quickly notice the obvious lack of trees. We are so use to them on the wet side, that it is rather startling to have so very few. And there is another reason to take note: they are wildlife magnets. We passed several thickets composed of Russian olive and willow. As we were nearing one, the perfect 2 by 2 tracks of a walking raccoon led across the trail and into the maze of branches. We decided to follow. 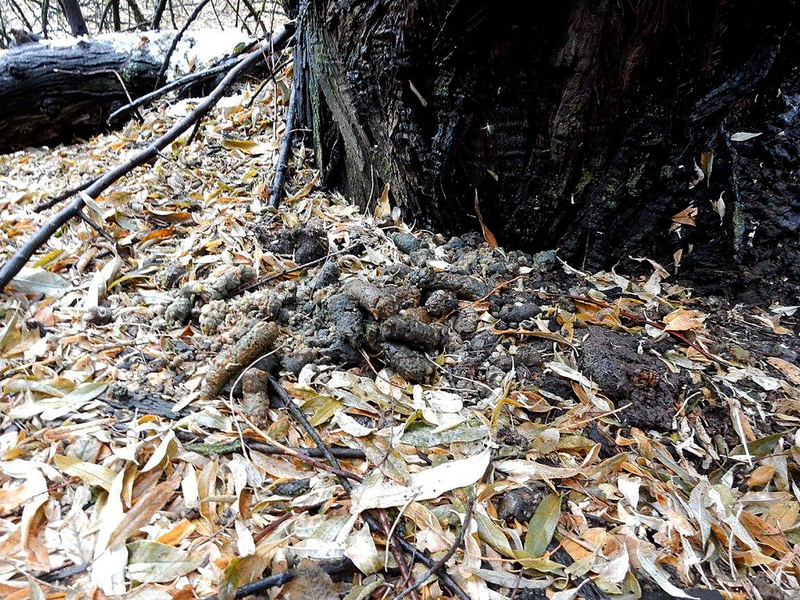 Inside, at the base of the largest Russian olive we found an impressive raccoon latrine. They often poop directly below their preferred sleeping trees. Some of the trails under the cover of the trees were worn well into the ground, clearly familiar and intimate pathways for the raccoons. It was oddly comforting space, and free of snow. We searched the tree tops closely, but no napping raccoons were seen. We followed another trail out of that thicket, laughing at ourselves for having gone in the hard way and continued on. The next thicket was a treasure trove. Just off to one side of the trail, under some roses and dense willows was a perfect circle of feathers. I crawled in carefully to get up close and investigate. Meanwhile, Kristian and the students found several scats and a owl pellet a few feet away. The mostly gray circle of feathers was accompanied by several white uric streaks from a bird of prey. That, along with the minimal damage on the feathers indicated the likely culprit was a hawk like the Cooper's hawk we watched hunting right next to our camp in a very similar thicket of willow. I poked around with my nose down in the feathers, and found more tracking treasures: the gizzard and the lower mandible with half the beak of the bird who's feathers were now matted onto the leaves! Looking inside the gizzard, it was packed full of the husks and black, shiny seeds of amaranth. The feeding hawk had clearly pulled out and discarded the gizzard. The plain gray lower beak portion was short and surprisingly broad for its size. Who was this bird? I looked closer and closer among the sea of gray feathers for something distinct. Something that would trigger a memory of feathers seen and identified before, or perhaps, of the bird to whom these once belong. There was no skeleton, no body to look at for clues. But, I did find some beautifully streaked feathers I recognized. Scapular feathers (those that hang down on the shoulders, helping meld the wing into the body and helping add some flare to this birds wardrobe. They were sodden, but then I saw it in my mind's eye: a quail! These belonged to a California quail. Meanwhile, Kristian and the students had dug into the contents of the owl pellet. Out of its dark, furry embrace emerged 2 skulls, from two different rodents. One of a deer mouse and one from a vole. They were nearly the same size, and it was only their skull features that allowed us to tell them apart. It so happens, that not a few paces further down one of the skulls would help us solve another mystery. An over-hanging rose along the trail edge showed gouge marks on its attached numerous rose hips. Both some of the seeds and the rind were missing. Below, some of the hips had dropped or may have been helped to drop by one or more animals. The hips on the ground looked more disheveled, bits torn out and tossed about and more seeds missing within. We discussed whether or not these were being disturbed by the same animal as those that hung above. And here, the skull of the deer mouse came into its moment of brief glory. We messed around and found that its paired orange incisors fit perfectly into the groves made in the skin of some of the rose hips. The hips on the ground looked to have likely been pecked open by birds, perhaps quail. It is wonderful when things can be confirmed so perfectly and immediately, if only tracking were always so easy! We found more wonders as we walked through the patches of snow. But, I will only mention one more and that was one we glimpsed being made. A flicker was flushed up from between the sagebrush shrubs as we moved forward. We followed it visually to a post, were it perched momentarily and dropped below it to leave some beautiful zygodactyl (K-or X-shaped) tracks. 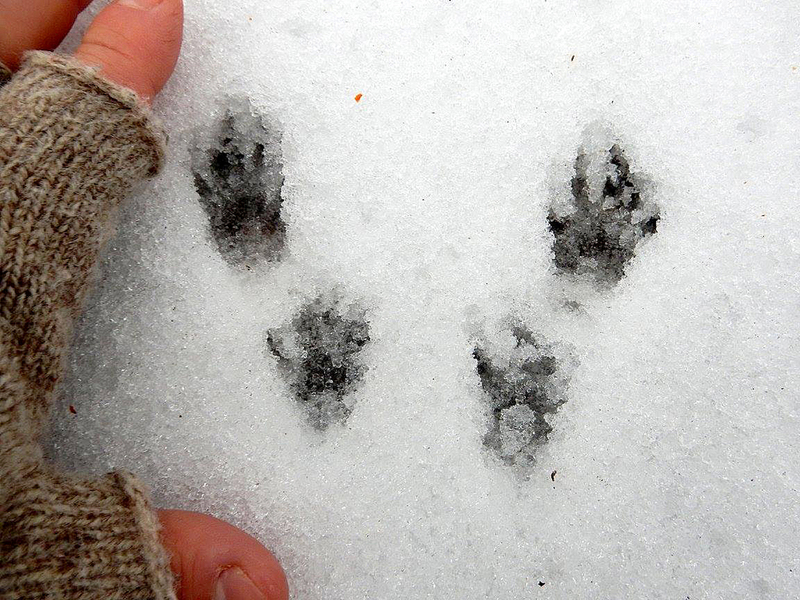 Walking back to where it had flushed from, we located the paired hopping tracks of where it moved around on the snow. Its final track showed how it pushed its feet down forcefully and left a nice impression of the pointed keel of its breast bone just before it lifted into the air. This has be a rather brief description of the many things we saw and experienced on just one weekend of tracking with the Raven's Roots Tracking Immersion Course! Keep an eye out for more soon and come join us for some time in the field. You never know what we might find together! Special thanks for Kristian Boose for providing most of the images in this article!